The minor lights display issue discussed here was fixed as of Feb 7, 2018 with version 4.82, Mac and PC. We encourage all to update to this new version, which includes other valuable upgrades. It also fixes the wind barb display, so we can now shut off the extra arrowhead on wind vectors from GRIB formatted model forecasts. NOAA has not made their needed correction (outlined below) yet, so we will leave this note for a while. But OpenCPN is good to go and getting better with each new version. OpenCPN is a powerful open-source (free to the user) navigation program that has many features of top of the line commercial programs. Downloads and detailed documentation are at www.opencpn.org. There is a Mac and PC version, as well as Linux. 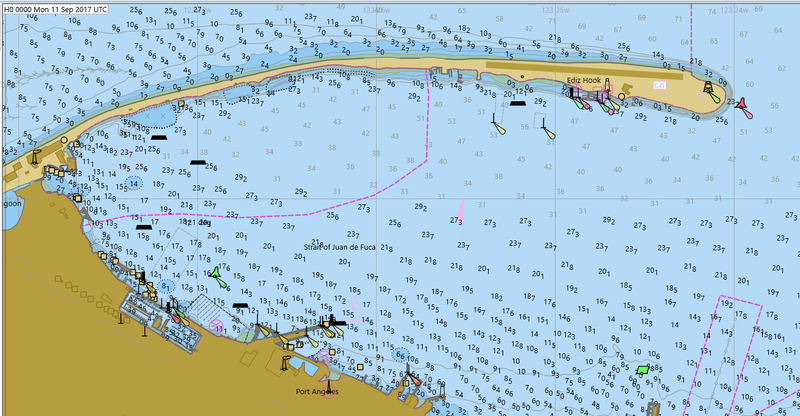 It shows both raster navigational charts (RNC), which are graphic images of the paper charts, as well as electronic navigational charts (ENC), which are vector products that include extended navigation information and offer many user display options. 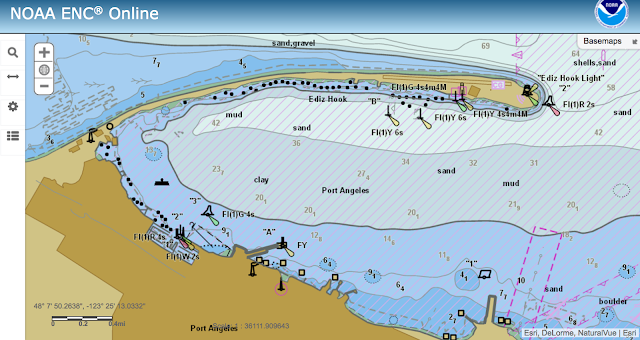 We cover ENC usage in our new book Introduction to Electronic Chart Navigation. OpenCPN is also unique in offering one of the truest presentations of vector chart (ENC) symbols as specified in the IHO standard S-52. This is a complex system, and many navigation programs have either taken shortcuts to simplify the presentation, or they willfully decided they have better ways to present certain symbols that are more useful to the mariner, and they use those, rather than the ones specified in S-52. Some of the diversions from the S-52 standard are minor and do not matter much. Others can be distracting, and hinder the use of ENC charts. We see numerous examples of this in several nav programs, but as noted this is extremely rare in OpenCPN, which is very good with the S-52 standard of presentation. The one exception I note now has to do with the presentation of minor lights... and I must add immediately that they are aware of this, and it will be fixed shortly, at which time this note will be deleted. But since we use this fine program in our navigation courses, we point this out for now. A "minor light" is one that has nominal range < 10 nmi. Major lights are shown as a ring (about 1" in diameter on the chart, regardless of selected chart scale); whereas minor lights should be a single flare symbol (teardrop) oriented toward 135T. The existing latest version of OpenCPN (v4.80) still shows the minor lights as small rings. So when using this version or earlier, please keep that in mind and know that later versions will have this fixed. Below is a sample from OpenCPN along with a couple samples that show the minor lights right, but then show the major lights wrong. 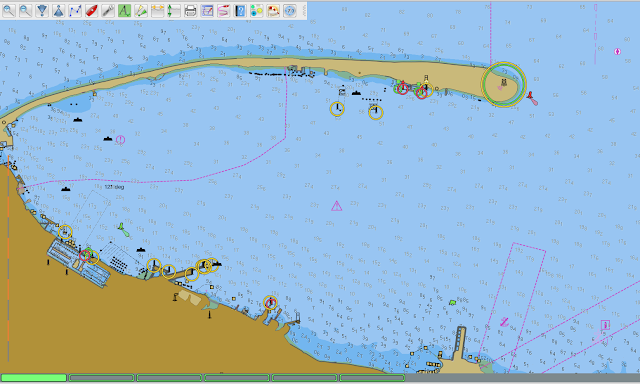 This view of OpenCPN shows the major light (Ediz Hook Lt VALNMR = 16M) properly with two rings one for each color (white and green... white is shown as yellow on ENCs), but the minor lights (<10 M) are shown as small rings, and these should be plain flare symbols as shown on the buoys. Below is another example from still another program showing the minor lights correctly but a different error on major one. Shows a tear drop for the major light, and indeed only one, where it should be two. Note that in traditional chart navigation and in the use of RNC, we tend to think of a signle light having two colors, rather than this object being two different lights. Indeed, in many cases it is just one light with different colored lenses that rotate around the light. But in ENCs, this configuration is called two lights, and each one is listed separately with its own specs. Often the nominal range of a color sector is less than that of the white sector—although this is not the case with the specific major light we look at here. See our ENC text for such details. Below still another error. It shows there are two lights there, green and white, but uses the wrong symbol. This is from NOAA themselves. They have acknowledged this error and say it will be fixed in the near future. Again, though, we see there is no question about the minor lights. OpenCPN simply has this wrong for now, and as noted, they will be fixing this shortly. This minor flaw in OpenCPN does not at all distract from our high recommendation of the program. 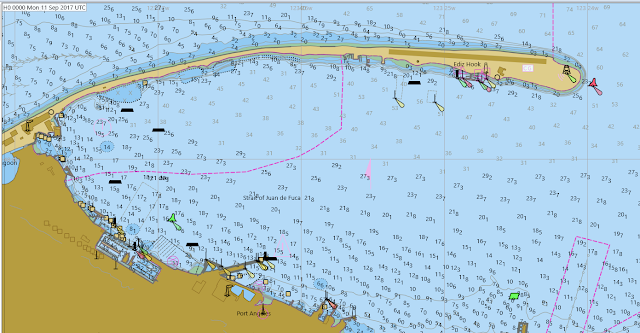 If navigation within a specific harbor in practice or in a practice exercise is being distracted by these little rings, then just turn the lights off (an ENC option) until you need them. I look forward to deleting this blog post. Usually we want to look forward, not backward, but to analyze a past event we may need to look into historic data. We come across this more often than most mariners would as we prepare training materials, looking for good examples. Fortunately, these datasets are all stored and we can get to them with normal tools. We look here first at the NDFD data as it is more complex than other data types—weather maps, GFS, RTOFS etc, are much easier. I record this here because I had learned this once, and then forgot it, and had to start over, and I do not want to repeat that. First, the question is how far back do we need to go. The real time source provides only the latest run, so this data expires every hour and we need special procedures to look back in time, even if just hours. There may be locations for intermediate data that I do not know about, but for now it seems either get the latest within the hour or wait till it moves to the archives. With maps, on the other hand, we have a full day. We can get, say, the 06z map anytime until about 09z the next day, when it gets overwritten with the next run. Procedure for older NDFD data. (1) https://www.ncdc.noaa.gov This was national climatic data center (NCDC), but is now National Centers for Environmental Information (NCEI). (3) Then select the year and month (ie 201708) / then select the day, ie 20170829, which happens to the newest in the list going back to 2008. Today is 0902, so we note it takes 4 days for data to find its way into the archive. This is another catalog page, that shows the individual files... all of them, CONUS, Oceanic, Regional etc, and as noted earlier the wind speed and wind direction are in two different files. There is no pressure, but a lot of other parameters helpful with convection forecasting. (4) Now we need to know which file to take, and we learn that from the file name structure, which all makes sense (in a sense) based on this page of conventions... except for the 99, which could be 98 or 97; I have yet to decode that part of the file name. ybuz9xkwbn corresponds to ST.expr/DF.gr2/DC.ndfd/AR.conus/ds.wdir in the live data. For wind speed we want a C, or files starting with YCU. ycuz9xkwbn corresponds to ST.expr/DF.gr2/DC.ndfd/AR.conus/ds.wspd in the live data. In other words, the last 4 digits in the file name is a UTC, and the first forecast of the dataset will be the next whole hour. The only way I presume that is from having opened several of these. In files checked so far, 9x=97 on wind direction is about 10 MB with 16 forecasts at 6-hr steps starting at the date, whereas a 98 is about 32 MB with 48 forecasts in 1-hr steps. For wind speed, the difference is 16 MB vs. 47 MB. I have to sort out the 97, 98, 99 significance, and will add it when learned. I think we always want the 98. Note the files have no extension, but they will open in LuckGrib as is, or you can add an extension .bin to load them into Expedition. For the latter you can just add both, and then select show both in Weather Set-up to get wind vectors... or just drag them onto the chart and they load automatically. For LuckGrib we need to add the files externally as explained elsewhere and then load them. I will come back shortly to illustrate this process by recreating the wind, sea, and current conditions at some recent maritime event of interest.